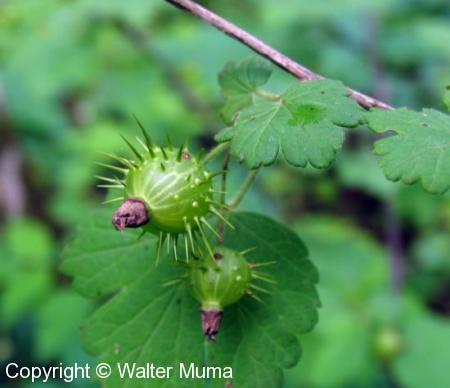 Distinctive features: Shrub; This Gooseberry is distinguished by its berries that are covered with prickles. The stems are smooth except for one or two weak prickles at the nodes where the leaves grow. 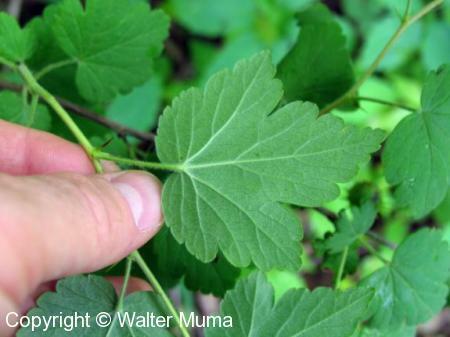  Wild Gooseberry (Ribes hirtellum) - stems smooth, with 1-2 spines at leaf nodes, berries lack prickles . Fruit/Seeds: Fruit covered with prickles. Photographs: 51 photographs available, of which 4 are featured on this page. SCROLL DOWN FOR PHOTOGRAPHS. An unripe berry, showing the numerous prickles that adorn it. In spite of the prickles, the berries are edible! A mature stem. Note the pattern of the bark. A younger stem. Note the single large prickle at the leaf node, and the fine fuzzy hairs along the stem.